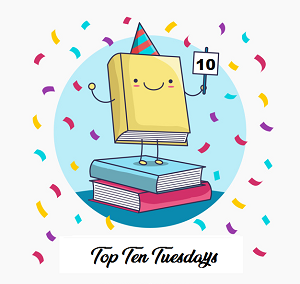 Top Ten Tuesday was created by The Broke and the Bookish in June of 2010 and was moved to That Artsy Reader Girl in January of 2018! Today’s theme is Top Ten Favorite Book Blogs/Bookish Websites. Melanie has been one of my first supporters, probably you know her from GR as her reviews are top notch. She is also the sweetest person in the reading community? USA? The world? or probably the universe!! I also like how she twists the TTT in a unique way each week. Becky has been supporting me since I started and she raised to the top very quickly. I like her tastes in books and she is an excellent student. She got approved quickly after I gave her some tips on edelweiss. Her son is also cute so follow her for more cool updates! I also like to call her the queen of MG, if you want good MG and YA recommendations then look no further because Carolina is the best. She always support me through my medical journey too. Her childhood memories and stories are so good so you are missing a lot if you are not following her. Sara has been following me from the start too. Around the same time Becky did and I was lucky for that. She is very active here and one of the top growing blogs. She always reads my posts and comments on them which makes my day! She is super friendly and supportive too. She also is a very fast reader, like really fast so you can get an idea about many books if you have her on your following list! Leslie and I have been friends for a short time but I have been carefully following all her posts and I found out that we have very similar bookish opinions which is always a great thing to find. She may be busy some times but that does not stop her from providing us with high quality posts. Who else would have been here than the creator of the out of this world blogger award. Kaleena inspired me to make the Supporter Award and she always have great tags and posts to share that keeps giving me new ideas. She also have great book reviews if you are looking for those. Satou is friendly and likes to interact with all readers, I sometimes write reviews that I think won’t be read but then Voila, Satou comments and likes them. He has a twitter account that is hilarious but kind of underrated. Anthony just recently celebrated his first blog anniversary with a totally cool new design. He is very active and shares many reviews, posts and awards. I follow him on GR, Twitter and blog because simply that shows how cool is this guy. I also don’t have many male YA/Fantasy reviewers so Anthony was a great discovery. There were my top 10 bloggers I follow. There are sure many others but I can’t choose anyone. I will mention the others at my monthly wrap up as I usually do. Oooh great choices! I just found 5 new blogs to follow and I agree the 5 I was already following are awesome! you’re welcome and you had to be in it! Aww, this has made by day. Thank you so much for including me! you are always coming up with creative stuff which is great! We should do a BR when we have more free time btw.